I lived outdoors for part of my student life. I've also lived indoors. And I've been sailing outdoors too, but I haven't done that indoors, and, oddly enough, don't particularly expect to. I very occasionally cycle indoors, but that's mostly an outdoor activity for me too. So, as you can see, the outdoors is very important for me! (I've even got my house largely surrounded by it!) I also like camping. There are many things I prefer about being outdoors... the plants, the breeze, the fresh air, the traffic (not! ), the animals.. but more than that, there is simply something that feels right about it... to misquote Cantor, God made the natural outdoors; the rest is the work of mankind. Of course, by outdoors I don't mean just any old outdoors; I'm thinking of the great rural outdoors. Still, there are some nice parks and wild spots in towns too; Cambridge (UK) is quite well-stocked that way, with Coe Fen, Lammas Land, the Backs and the Commons. 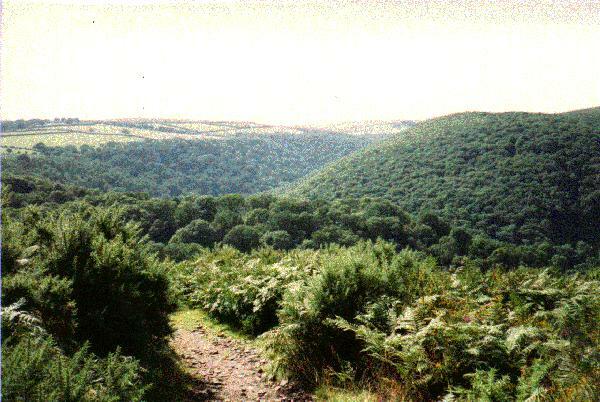 Many places are outdoors, including most of my favourite ones, and one of my greatest favourites is Exmoor in Somerset (in the West Country of the UK). Some places have a lot of outdoors; Outer Mongolia has a fair bit, as does the "Krasnoyarskie Stolby" National Park in south-eastern Siberia. There are several kinds of outdoor places that appeal to me particularly in their various ways... the moorland, forests, lakes and the seashore all spring to mind. We don't have moorland or heath in the U.S. I'm familiar with those words from The Secret Garden and novels by the Bronte sisters. Is it basically a damper version of our prairies? Ah, I remember The Secret Garden! Yes, the moors are popular in stories. They're not particularly damp, although they often have streams running through them, with wet spots around. They have really harsh vegetation -- heather (maybe you call it ling? heather is the English word, ling is the Scots), gorse, bracken (a large dry fern). Moorland is always high ground, and I suppose it can't support intensive farming, so is quite sparsely populated (or unpopulated in parts). You can walk for miles and not meet anyone... it seems pretty safe, although there are rumours of large wild cats, possibly pumas, in some places, maybe escapes from a zoo, or it could be a coverup for someone not keeping a dog under control! runs the Lyke Wake Dirge. Heather has a purple flower, gorse a bright yellow one. Neither plant is native in the US. I just looked them up in an American dictionary; heather is `Any of various heaths ... of England and Scotland', and gorse a `spiny European evergreen shrub'. I'll get some photos of these plants, and scan them in and put them on this page when I get round to it... should look neat if I edit the background out to transparent and make them look like they're growing there! :-) For now, you can look in the foreground of this photo for some moorland plants. I love forests, although I'm more of a moor person. I particularly like the ones in Somerset, such as the fir-wooded combes on the dip side of the Quantocks, or the natural woodland on their scarps. I'm not so familiar with these, not having done that much sailing. Once I was outdoors on a windy and rainy day, and I had a really neat idea for being outdoors more comfortably in bad weather: arrange some thin flat solid objects, one above you to keep the rain off, and some at the sides to keep the wind out. Then I realized that I'd just invented indoors, and went back in out of the rain.